Manchester United have been dealt a boost in their ongoing pursuit of Jerome Boateng, with the Bayern Munich defender admitting he’s considering his future and could leave the Allianz Arena this summer, reports the Mirror. United have long been linked with the £50m-rated centre-back and could well win the race for his signature if he’s looking for a new challenge next season. Marcos Rojo and Daley Blind are expected to leave Old Trafford in the coming months which could open the door to Boateng joining as a replacement. The 29-year-old signed for Bayern from Manchester City in 2011 and has gone on to make more than 250 appearances in all competitions. 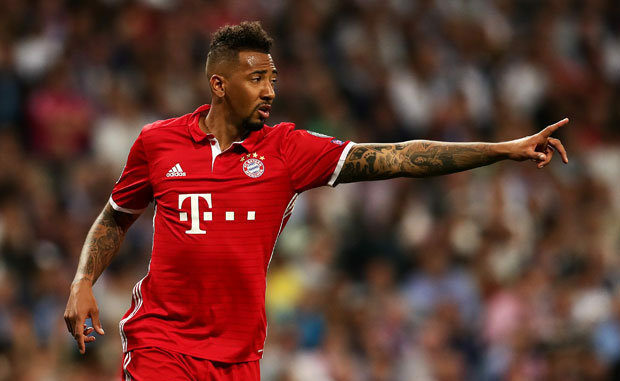 Boateng has won six Bundesliga titles, three DFB-Pokals and one Champions League during his time with the perennial champions but admits he yearns for a fresh challenge. “Those are not necessarily classic questions regarding the career, but vital questions and, in the end, questions that drive people.” It’s bad news for Bayern but fantastic news for suitors who are in the market for a highly-decorated defender, although England might not be his preferred destination. Boateng had a failed spell in the Premier League for City between 2010-2011 so he may be reticent to a return. However, if Jose Mourinho’s side meet his asking price and offer a lucrative contract, it could convince the centre-back to give Manchester another go.